The front fascade of our monastery faces Centre Street in Jamaica Plain, MA. There are two wings flanking a center section which acts as a main entrance. A wall encloses the monastery around the sides and rear. There is a loggia in the rear which forms a protected walkway. A small separate building in the rear serves as a crafts center for our sisters. There is also a screened area for drying laundry outdoors. 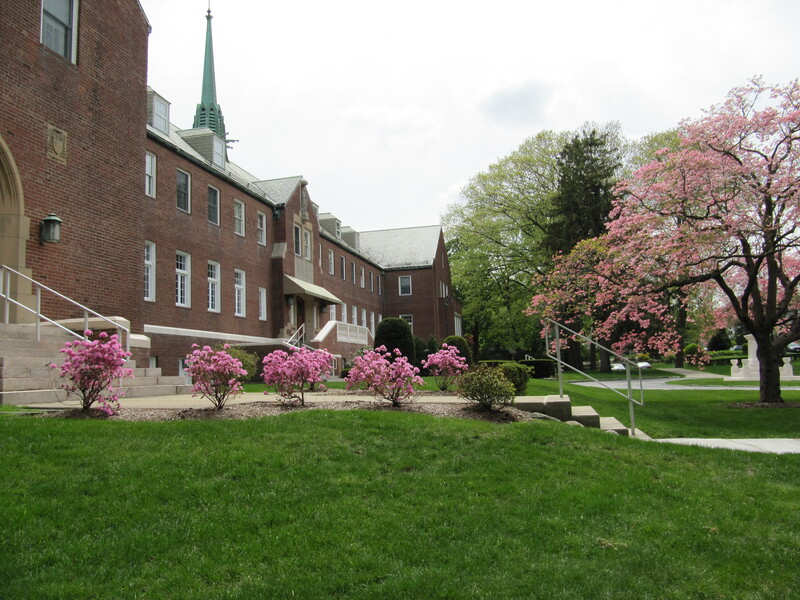 We have a number of paths which lead through areas cultivated with flowers and grass and various statuary of our Blessed Mother and Child, the Pieta, St. Anthony, St. Francis, and St. Clare. We also have a seasonal vegetable garden and some fruit trees which graciously yield their fruit. The front entrances of our monastery lead into the Chapel (far left of building) and into our reception hall (center). The front center entrance of our monastery leads into our reception hall. There is a statue of St. Francis in the circle of the driveway. The left side of the rear of our monastery shows the loggia or external covered walkway. Our summer house and hermitage. A mid-summer view of the back garden…which is cultivated by Sister Clare Francis. And the garden covered in winter white. The Pieta in the apple orchard. Our Monastery choir has undergone some recent renovations. These included a heating and air conditioning system for the Chapel, plus new flooring, lights, and “Prayer chairs” facing the Blessed Sacrament. The rose window in the Chapel is in the back door leading to the garden. Please visit our illustration of Daily Life for some other views of our monastery.